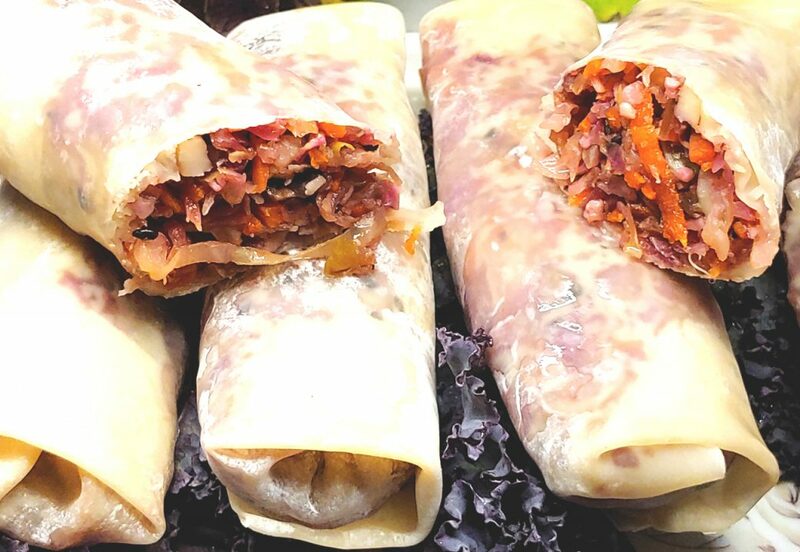 This is a nice alternative to egg rolls. Gyoza wraps typically do not contain eggs or dairy. Always check the labels. Baked Gyoza rolls stuffed with green and purple cabbage, onions, celery, carrots, mushrooms, garlic and ginger that were sauteed in Vegan white Miso broth. Seasoned with black sesame seeds. Wrapped and baked. TIP: In place of using oil, I keep a water spray bottle handy. Spraying the tops of your Rolls helps in the cooking process as well as keep them from getting to dry. This technique I also use for baking mushrooms. 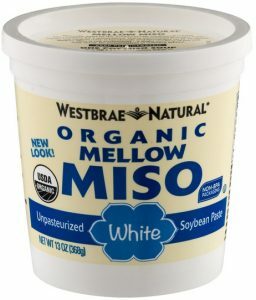 Combine the saute-liquid ingredients in a small cup and mix until the miso is thoroughly dissolved and add to a hot pan. 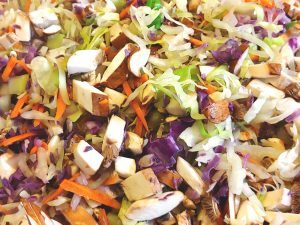 Add all the filling ingredients and mix well. This will take about 8 minutes to cook. Mix every few minutes. While the filling is sauteing, preheat your oven or toaster oven to 400 degrees. Prepare a small baking sheet and line with parchment paper. 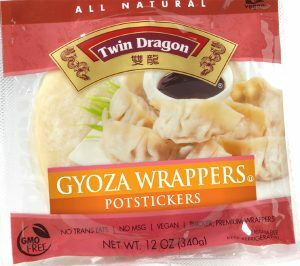 For the wrappers, I used Twin Dragon Brand Gyoza Wrappers. They are vegan-friendly and contain no eggs or dairy. They are 6” x 6” in size. Fill each wrap with a rounded (overfilled) ⅓ cup measuring cup. This batch should yield 10 rolls. 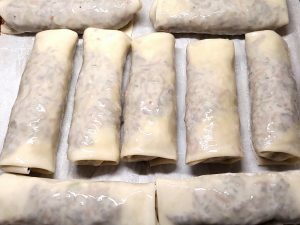 Place each roll on the parchment-paper-lined baking pan and bake at 400 degrees Fahrenheit for 30 minutes. After 15 minutes I like to re-spray the tops with my water bottle. If you like your rolls crispier, bake them 10 minutes longer. Makes 10 Gyoza rolls. Serve with your favorite dipping sauces.